Chef Andy Long puts Appalachia on the table (by way of Louisiana), and everyone — from locals to leaf peepers — is eating it up. But it’s the mountain community he’s found and fostered that makes his farmhouse restaurant feel like home. Andy Long thought he understood the risks of running a restaurant in a rural mountain valley — long winters, tight margins, scarce workers — but he hadn’t counted on a flood. His restaurant, Over Yonder, had been a hit from the moment it opened in Valle Crucis in June 2014. Almost four years later, he was set to open his next venture down the road, a sandwich shop called Lucky Pickle, as soon as the health inspector signed off on the walk-in cooler. Over a stretch of several days in mid-May, the mountains around Valle Crucis took up to 12 inches of rain. One night, Dutch Creek, a Watauga River tributary, rose out of its banks, crossed Broadstone Road, poured through the walls of Lucky Pickle, shoved the furniture to one side, and then withdrew, leaving behind a half-inch of mud coating the floor and one small rainbow trout flopping in a puddle in the parking lot. Andy arrived just after dawn to survey the damage. An employee rescued the trout. Then reinforcements rolled in: first, a few more coworkers, then assorted friends and neighbors, including a septuagenarian who mopped and cleaned so furiously that he “made all the kids there working look slow,” Andy recalls. Order was restored, the sandwich shop opened a few weeks late, and Andy discovered, yet again, that when it comes to running a restaurant in a small town, the rewards far outstrip the risks. Andy wears a small knife on a lanyard around his neck and, on his left arm, a sleeve tattoo of a leaping trout set against a mountain landscape. On any given day, two fly rods might be poking out the window of his Honda pickup. Fly-fishing, he says, is “how you turn your brain off.” This form of midstream meditation serves him well amid the clank and hum of a busy restaurant. He is a still point, around which a community of farmers and foragers, bread bakers and coffee roasters, line cooks and servers, has gathered. Over Yonder occupies a 19th-century farmhouse that sits on a low rise above the valley. 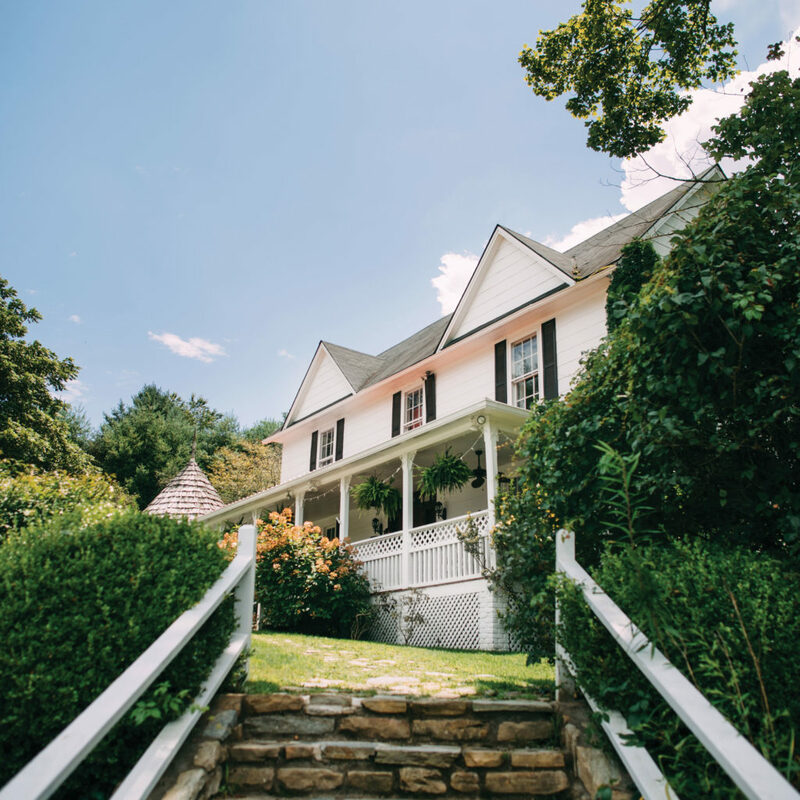 The building rambles, as an old farmhouse must, with 28 tables tucked into four rooms and scattered across a front porch, a gazebo, and a multilevel deck. In the high season, those tables are packed, and servers hustle plates of pan-fried trout and tomato cobbler to summer residents and day-trippers. When the snows arrive in November, the pace slows, and locals vie for tables before one of the three fireplaces. But in every season, Andy takes his cues from the land, its people, and what both can provide. Over Yonder sits nine miles from Boone, 100 from Charlotte, and 2,700 feet above sea level. It’s an out-of-the-way spot for an ambitious restaurant, but, in one sense, its location is ideal. The twin-gabled farmhouse was built in 1861 by Henry Taylor, who also opened Taylor General Store across the road. He later sold the store to a man named W.W. Mast, and today, the Mast General Store empire stretches across the Carolinas and into Tennessee. Every year, tens of thousands of people make the pilgrimage to the original store in Valle Crucis, where they creak across sloping pine floors to buy Chaco sandals and gee haw whimmy diddles. Shoppers exiting the parking lot can turn left or right onto the main road, or they can pull straight ahead into Over Yonder’s driveway. A half-mile down that two-lane road is the historic Mast Farm Inn, an upscale property where Andy became chef in 2012. 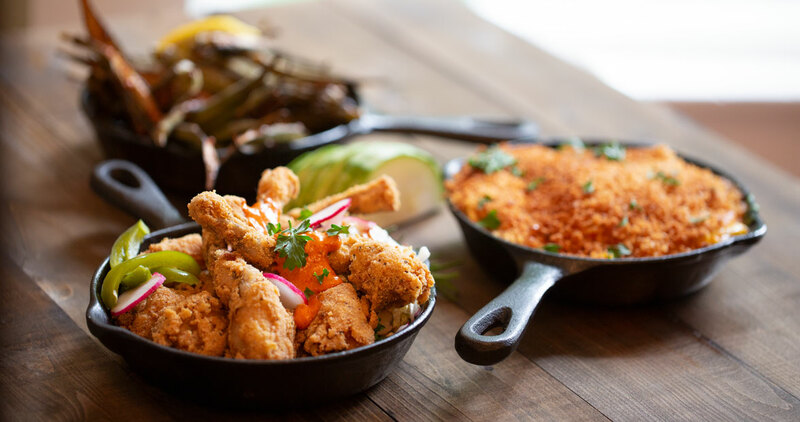 Two years later, he teamed up with the inn’s owners to open Over Yonder, serving Appalachian-inspired dishes with a twist. By 2016, the venture had become so successful that he bought out his partners and became the sole proprietor. Although his food made him seem like a High Country native, he was born and raised in Baton Rouge, where he caught the restaurant bug as a teenage line cook. “It’s super cliché,” he says, “but it was the rush, the dance behind the line — that’s what got me into it.” Over hot stoves in New Orleans and Pensacola, he learned the trade, and then embarked on formal culinary training at Johnson & Wales University in Charleston. The chef’s life took him north, to a weight-loss camp for children — ask him about the Great Baklava Riot of 2003 — and then to a French restaurant, and, finally, south again to Charleston. When his wife, Megan, became pregnant with their second child in 2005, they decided to seek a quieter life. They moved to Boone, where Andy ran the kitchen at Storie Street Grille in Blowing Rock. “That’s where I started to come into my own as a chef,” he says. Barbara Kingsolver’s book Animal, Vegetable, Miracle, a paean to local foods, became his touchstone: “I read that and I’m like, ‘Oh my God, I have to change the world now!’ ” He haunted the Boone farmers market and collaborated with sustainable agriculture experts at Appalachian State University, bringing home the bounty to Storie Street and, later, to Mast Farm Inn. Though the inn’s menu was French-inspired and “super fancy,” Andy says, his coworkers were homegrown. Their families had been scratching out a living from the mountains for generations, and they knew a thing or two about what we now call local food. From them, Andy learned about curing pork, fermenting sauerkraut, and foraging for mushrooms and wild greens. He set out to explore mountain cuisine, both in the kitchen and in the woods. On fishing trips, his fly rod often remained propped against a streamside tree as he busied himself digging ramps or plucking hen-of-the-woods mushrooms. At Over Yonder, Andy translates traditional mountain dishes into the language of a modern restaurant. 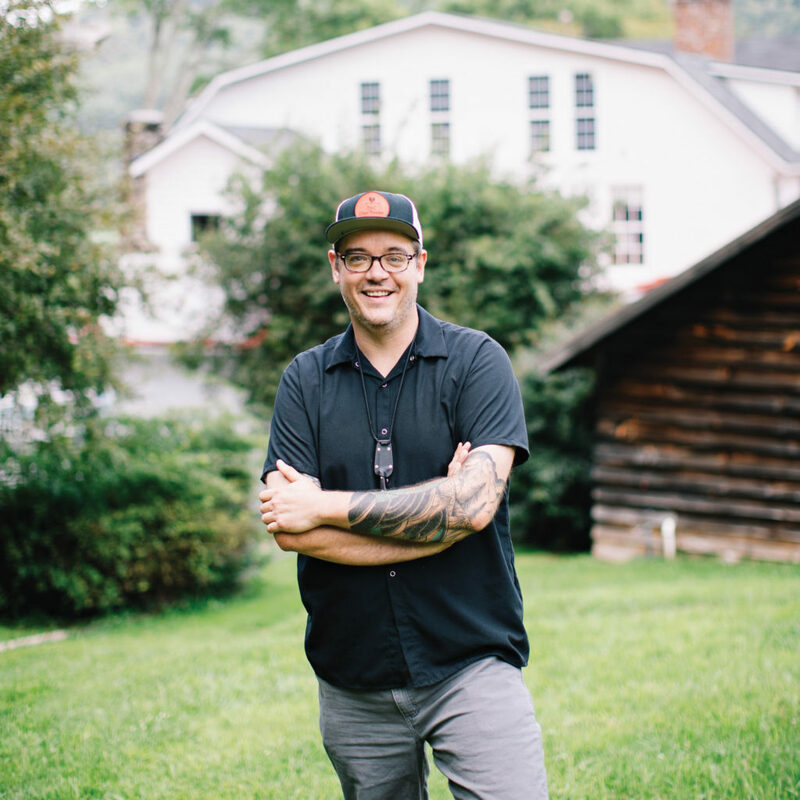 When it opened, Andy says his goal was “to tell the story of Appalachian foodways in this historic setting.” Drawing inspiration from books — including the Foxfire series — his menus included tomato pie, skillet-fried chicken with white gravy, country ham with cheese curds, and cornmeal-dusted trout. 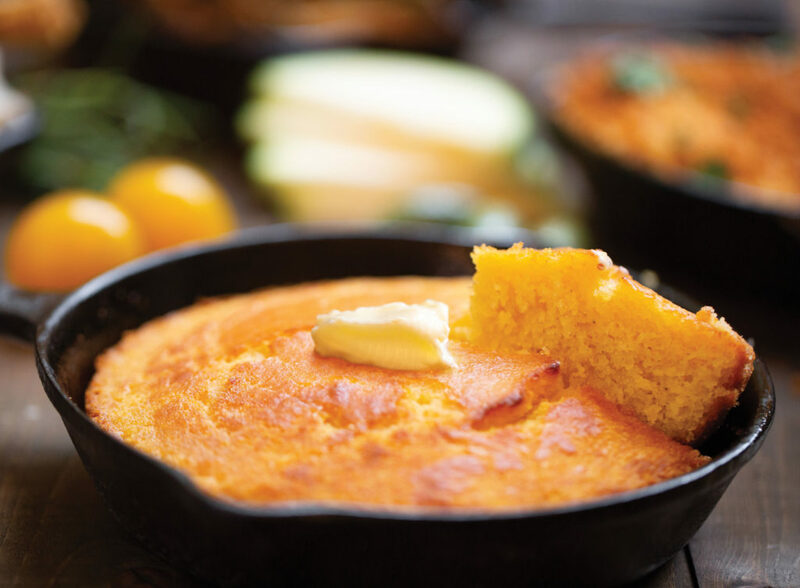 He also featured everyday Appalachian fare like pinto beans, cornbread, and pickles — “things that were on all the dinner tables around the restaurant but not in restaurants at that time,” he says. The menu has become more eclectic, settling into a comfortable blend of customer favorites and seasonal inspirations. If a forager walks into the kitchen with a bag full of wild asparagus, Andy buys it and cooks it immediately. Dishes that started as specials — like the pork burger topped with onion-apple butter jam and Napa slaw — have claimed spots on the year-round menu. The flash-fried okra should put French fries out of business, and the pickled apple slices walk a line between sweet and sour, tender and crunchy. 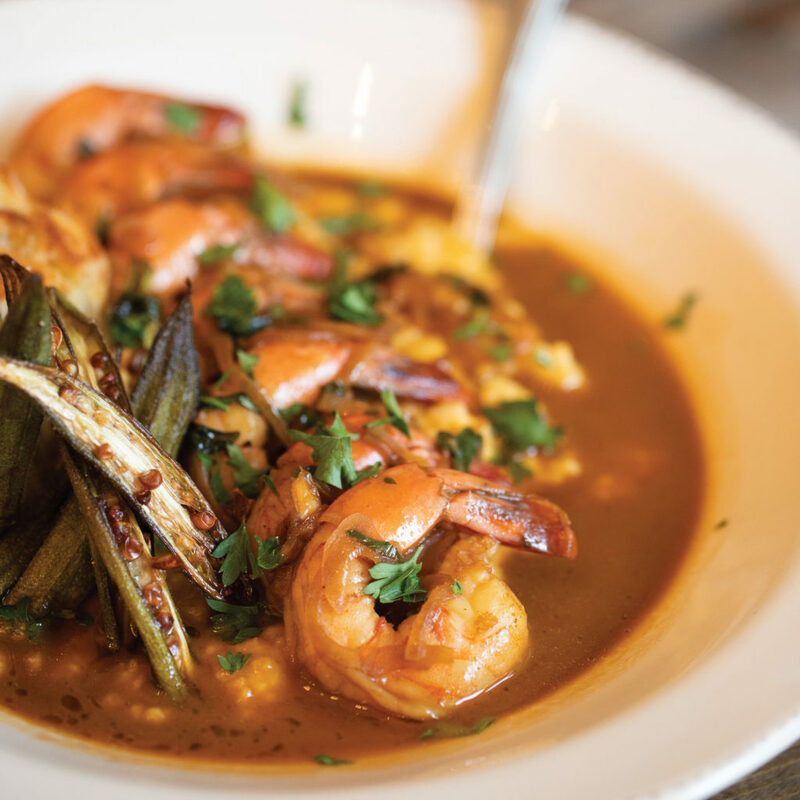 For years, Andy avoided cooking the foods of his childhood — blackened redfish, crawfish étouffée — because he didn’t want to be the Louisiana guy sliding by on Creole or Cajun shtick. Early influences found a foothold nonetheless: Andy’s potlikker gumbo starts with stock made from collards and contains country ham. Daringly, he also adds okra, a vegetable that back home appears only in seafood gumbos. “Up here, I can get away with it,” he says with a laugh. He’s only half-joking when he says that he started Lucky Pickle so he’d have a reason to make a proper Louisiana roast beef po’boy. “It has to be sloppy as hell,” he says. “You serve it with a roll of paper towels.” Here, the sandwich is a local creation, served on rolls baked by Owl Creek Breadworks in Boone, and made with stock using bones from Shipley Farms. That sentiment is as true in times of plenty as it is in times of hardship, as Andy’s friend and local coffee roaster, Don Cox, knows all too well. Andy first discovered Don’s roasted coffee beans at the farmers market, and he liked them so much that he helped Don create a wholesale line. Don became such a fixture at Over Yonder that he kept a hand-grinder and brewer once owned by his German grandmother on a shelf in the restaurant. In 2015, Don’s roasting operation, which was just across the road from Over Yonder, burned to the ground in an arson fire. The only surviving signs of Don’s life in coffee were the mementos he kept at the restaurant. In the mountains, the winter transforms the restaurant as surely as it does the landscape. When the second-home owners return to Florida and the leaf peepers have had their fill, the locals reclaim the dining room. “Those are the ones that become special to us, because they keep coming back and we get to know them,” Andy says. They gather at the prized tables in the bar area, where, on a snowy day, the warm brick walls and flickering fire conspire to create an almost absurdly cozy atmosphere. Happily sipping petit verdot from Jones von Drehle Vineyards & Winery in the Yadkin Valley — Andy’s local recommendation — between bites of rabbit confit and flash-fried collards, diners are blissfully unaware that late fall and winter are lean seasons here in the High Country. Or maybe they know what Andy does: that the absence of one bounty provides room for another. Mark Essig is the author of Lesser Beasts: A Snout-to-Tail History of the Humbling Pig. He lives in Asheville.